Visuals are important to the learning process. Consequently, most educational institutions now use projectors as teaching aids. 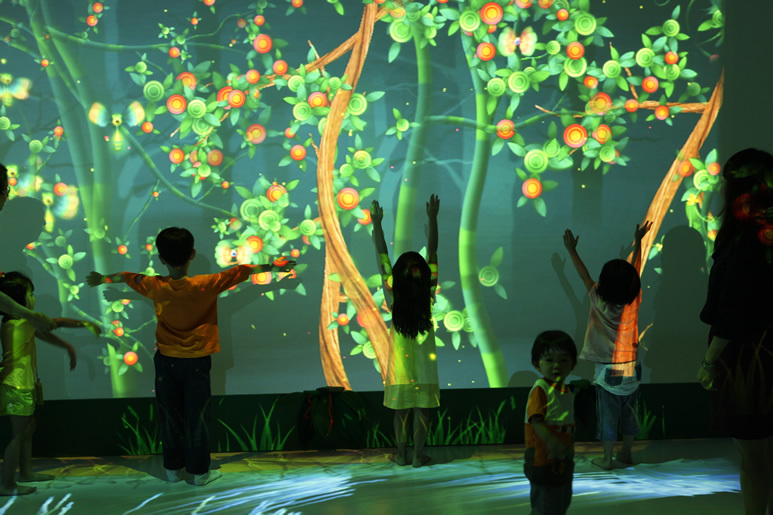 Learning recreational facilities such as museums, zoos, planetariums and aquariums can also benefit from the use of projectors. This is especially true when it comes to setting up displays and exhibits. You’ll want to make sure that your presenting images are clear and easy to view. To do this, you’ll need to purchase the right projector for your specific needs. 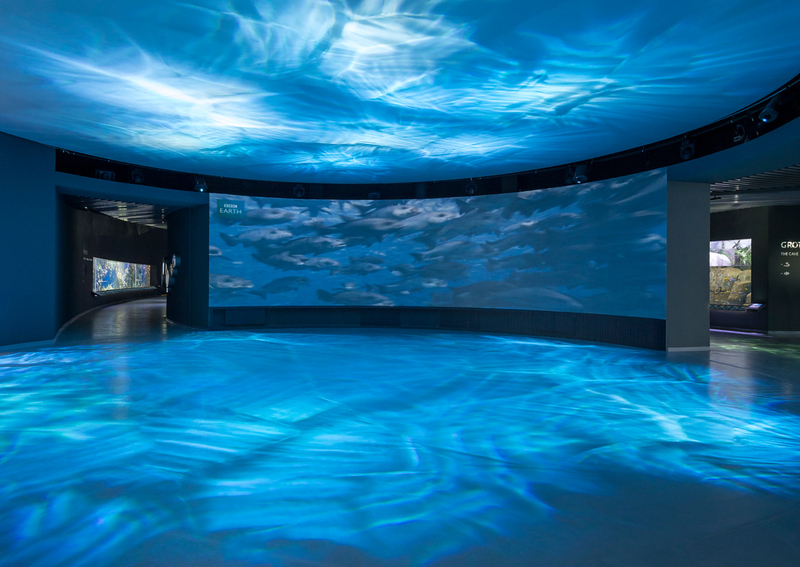 Lighting often varies in museums and aquariums. Therefore, it’s important to choose a projector that can work in rooms that are really dark or saturated with light. To ensure good images in all types of lighting, you should choose a projector with a minimum of 3000 lumens. A projector with 3000 lumens or more can also work for outdoor presentations. Portability is also important. Choose a projector that is both small and lightweight so that you can easily move it from room to room. You may consider choosing a larger projector if the device will be mounted in an auditorium or other permanent exhibit area. Next, look for a projector with a built-in short throw lens. This is an important feature to have while visitors walk in and out of exhibits or presentations at these facilities. A short throw lens will allow the projector to be really close to the screen without distorting the image. This will prevent people from walking between the screen and the projector and thus blocking the picture. You’ll want to be able to connect your projector to other sources such as computers and DVD players. To ensure connectivity to other equipment, your projector should have video, audio and HDMI inputs. Finally, make sure the projector you choose is quiet and will not disrupt the enjoyment of your exhibit. Other features including a long bulb life and no hassle set-up are important to consider as well. Projector technology continues to advance every year. From laser projectors to 4K options, today’s latest and greatest tech seemed unreal just a few years ago. But designers and engineers are incorporating projectors into more non-traditional uses, and in the future, it’s likely projectors are going to be used for a lot more than business presentations and home entertainment. Just in the last year, projectors have been incorporated into a range of mind-blowing applications, including augmented reality, real-time communications, and in the kitchen. Here’s a look at a few of these futuristic sounding applications, but don’t expect to see them available to consumers in the near future. A few are still light years away. At Milan Design Week, furniture maker IKEA unveiled the cookbook of the future: a projector-enabled, augmented-reality recipe book. Essentially, using a camera and projector, IKEA envisioned a product that would provide recipes based on the ingredients on your chopping blog. The recipe is then displayed on the counter via a projector. So, for instance, if you had a tomato, some bread and cheese, a recipe for melted cheese sandwiches and tomato soup would be projected. Sounds far out, right? 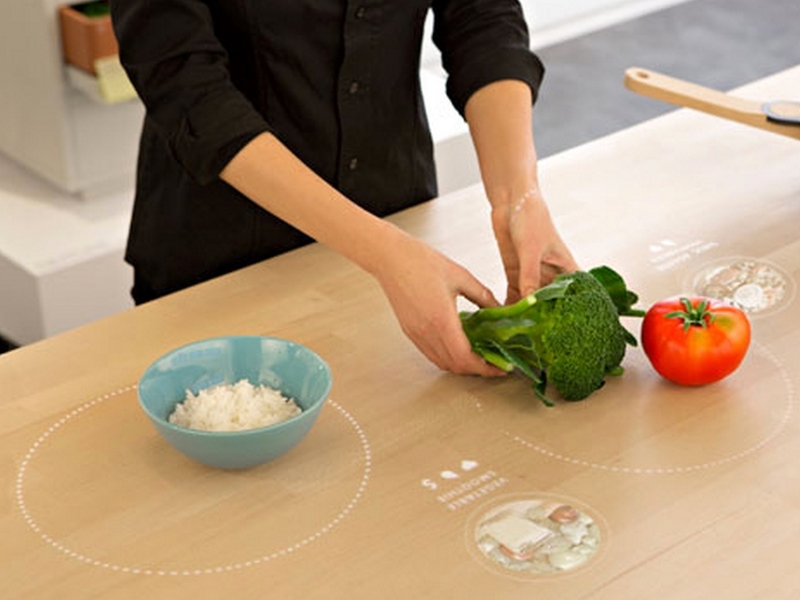 Well, don’t expect the real-time recipes anytime soon – IKEA’s design was for a kitchen in 2025. Here’s an interesting idea: Light jewelry. That’s right. What if you could wear a projected necklace made of light? That’s the idea behind NECLUMI. The designer’s “necklace” is actually an image coming from a tiny pico projector that’s attached to the wearer’s clothing. The projector then displays a piece of jewelry that’s sent from a smartphone app. This really leaves the door open for a variety of light-enabled displays, bringing traditional jewelry into the 21st-Century. 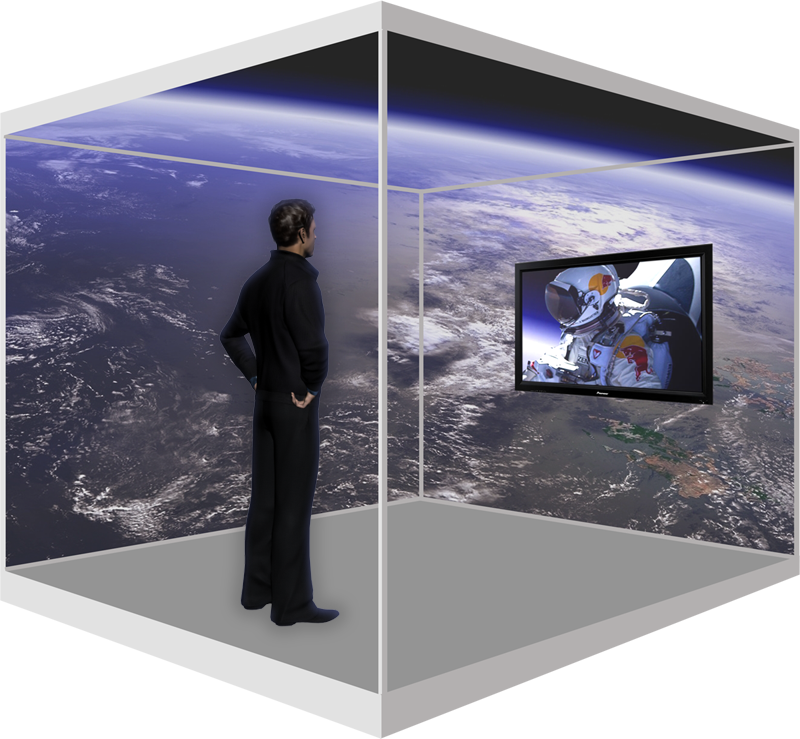 Virtual reality is progressing quickly, and one of the latest developments centers around a projector-enabled set-up. French start-up Catopsys and an R&D firm recently unveiled the Immersis projector. The projector displays a panoramic, virtual reality image throughout a room. On screen, you see the game that you’re playing, but the projector adds the additional parts of the image that aren’t visible. Thus, gamers are completely immersed in a virtual reality world. The firm successfully raised funds for the project via Kickstarter, so keep your eyes peeled for reports on its developments. This one isn’t exactly futuristic, as it’s still possible now. But the use of a projector to display a Dungeons and Dragons board is pretty clever. One reddit user recently showed how he used a projector to display a digital version of a D&D board onto a tabletop, making for a completely unique gaming experience. Who knows maybe we’ll start seeing this more and more. A San Francisco-based company is currently working on a projector-enabled dashboard mount for every vehicle. Essentially, the designers are using a projector to display an image on a small reflective screen. 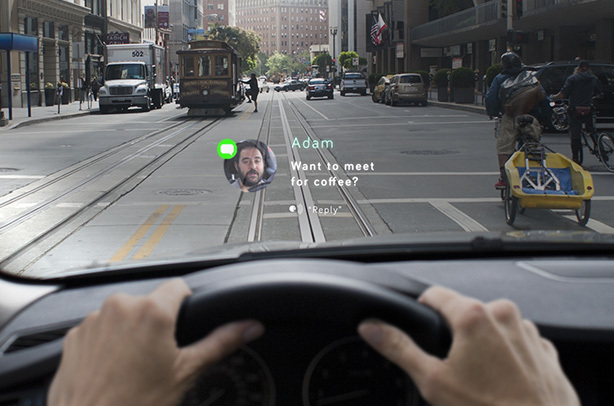 The projector is synched with the driver’s smartphone and the car’s computer, and then information is displayed on the reflective screen. So, if you receive a text message, a notification would pop-up on the screen. Currently, this project is in development stages. Google was recently awarded a patent for a product that has the potential to change the way we paint the walls in our homes. Here’s the idea: You would cover your wall with a photo-reactive paint. Then, a projector would beam light onto the wall, and the paint would be “activated” and create a moving image, similar to a screen saver. Hey, in the future, you might no longer need wall hangings. Of course, this is just in the patent stage, so it’s yet to be seen if this will ever come to fruition.